A few days ago, I read Yellow Crocus, my first ever tryst with a story based on slavery in America. And the very first novel on this sensitive topic had made me curious enough to dig out classics on Slave-hood. And as I searched Amazon for some good books on slavery, I laid my hands on Incidents in the Life of a Slave Girl Written by Herself. While the title of the book is too long and a bit too simple, I discovered this novel written by Harriet Ann Jacobs quite good. 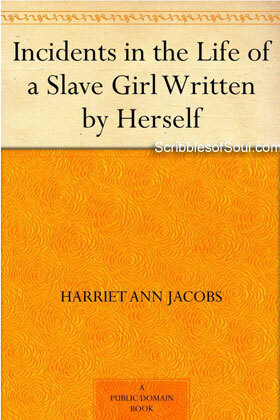 The book is based on the true life story of the writer Harriet. But as she wrote it in a tumultuous time when Civil War was going on in America and it was not very safe for escaped slaves, she had to conceal her identity and assume the name of Linda as the protagonist. This one of a kind story revolves around Linda, who did not even know for the first six years of her life that she was a slave. She lived a carefree life as a child in the company of her carpenter father and a well respected maternal grandmother Martha. But, soon Linda is taken under the umbrage of Dr. Flint, who despite claiming to be a true Christian and a man of high ideals and good connections, is a lecherous man and gets smitten with the young Linda. From thereon, life becomes constant struggle for poor girl as she tries hard to keep Flint away and even gets involved with another white man just to ignore her master’s amorous advances. As Linda runs from pillar to post to evade the attention of Flint, the story becomes multifold encompassing the lives of many other slaves within the love-hate story. As I had begun reading the present book immediately after Yellow Crocus, in my mind I kept comparing the two. And, somewhere I felt that had Mattie of Yellow Crocus not run away, she would have surely become Aunt Martha, grandmother of our present protagonist Linda. The two stories seemed off shoots of one another and yet absolutely different. While on one hand, Yellow Crocus was rich in symbolism, beautifully presented lesser known customs of slaves and gave a rich sneak peek into lady’s upbringing, the present novel Incidents in the Life of a Slave Girl is more of an appeal to the society rather than a novel, yet its honest portrayal of characters more than made up for lack of exciting events or great diction, especially the heartrending seven year exile Linda had to undergo and the honest description of gruesome atrocities on slaves took this book to next level. Though, I may seem insensitive but initially I felt that Linda had a much easier time than most of the other slaves. But when she was forced to stay in her own small attic for seven long years, locked off from her beloved kids and even after Flint has died, she had to struggle to secure her freedom, she won all my sympathy. I think, Harriet was lucky to get timely help from her benefactors or else she would have become yet another unknown victim of unspeakable tortures, the poor slaves had to undergo and we would have never got to hear her side of the story. Incidents in Life Of A Slave Girl is an honest attempt by a wronged woman, a true emancipated voice that holds its grounds even after 150 years of its conception. Do read this book to know the extent of degradation, a potent mix of power and superiority can bring about. How a man becomes insensitive to his fellow beings, considering them nothing more than a piece of property, to be sold or rented at whim, is well presented here. Indeed, a thought provoking read.